Remember when you were a kid and every week you had a show and tell in class? Around 3rd to 5th grade, many of the kids seemed to be popping fingers and elbows out of place, showing off their double and triple-jointed skills. Just watching them was enough to make my bones hurt. 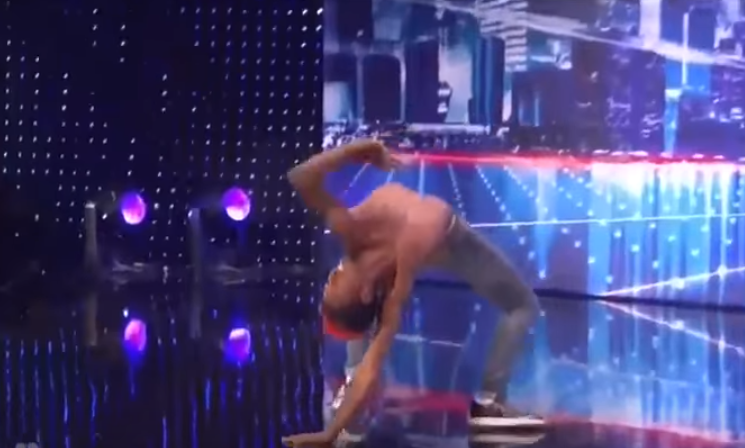 Yet none of that compares to the feeling I got watching this America’s Got Talent contestant’s body-bending performance! Alonso “Turf” Jones is a self-taught street dancing-contortionist, but when you watch his dance routine, you’ll think he’s more slinky than human. Turf was raised by his single mother who had common dreams for her son. When he graduated high-school though, Turf decided there was no better way to spend his time than performing dance moves for a crowd. When he broke the news to his mom that he wouldn’t be going on to pursue a “normal” life, ditching college and corporate offices for a spot on a busy street corner, she kicked him out of the house! When faced with homelessness, most people give up on their dreams. Many think if it were meant to be, it wouldn’t be that hard. Turf took a different attitude, figuring that if he was going to become a famous dancer, he would need to practice…a lot! What better place to do that than on the busy streets! He spent every waking moment for two years dancing for impromptu audiences, sometimes going all night! Although Turf was homeless, he wasn’t broke. He said that when performing, he’d often walk away with $150 to $300 in his pocket per night! That’s substantially more than the average college-age student is making. Turf spent a lot of time proving to himself that following your dreams is worth it. In his audition though, he proved it to the masses. Nothing could stop him from pursuing his dream. He was made to dance, and he proved it with this tour de force! Continue to the next page to see the performance that shot Turf, a contortionist, like a shooting star straight to Vegas!